I am frequently asked for advice on how to become an FBI Profiler. I hope this information is helpful. First, I would advise you to go to www.fbi.gov and review the current information on job requirements, paying particular attention to the requirements to become an FBI Agent. Requirements change over time, so this is your most current source of up to date information. All of the information in this piece is based on my experience and will certainly change over time. So it will be up to you to verify current standards and requisites. At this time, in order to work as an FBI Profiler in the Behavioral Analysis Unit (BAU), you have to be an FBI Agent. This means you go through the FBI Academy, which is approximately 4 months long. This training is very rigorous and involves classroom training in courses that include psychology, interviewing, and legal issues. You will also be trained in firearms and will go through a challenging physical fitness program. Once you graduate from the FBI Academy you will be given “orders” to a specific FBI Field Office. So you must be willing to relocate from your hometown to another location. It could be New York City, Detroit, Michigan or any number of field offices in the U.S. As a new agent you will be assigned to a “Squad”, where you work a variety of investigations. Developing experience as an investigator is critical before applying to the BAU. Most profilers working in the BAU have between seven and fifteen years of investigative experience before transferring to the BAU. The FBI requires a four-year college degree in any major in order to apply for the Agent position. You will want to choose a degree that YOU like, so you will complete your education. Agents in the BAU have had a variety of degrees from Psychology, to Political Science, to Math to Criminal Justice. Some of the BAU profilers have Advanced College Degrees and some do not. At this point, having an advanced degree to apply to the BAU is not required for all job openings. However, that could change, and you will want to review the most current information on www.fbi.gov . The work we do as FBI Profilers includes analysis, interviewing, writing and public speaking, assessing human behavior and group behavior. Therefore courses in psychology, sociology, philosophy, journalism, public speaking, in my opinion, could be quite helpful to you. Many FBI Agents apply to work in the BAU. It is a competitive process and many factors are considered – depending on the particular job posting at the time. Therefore I cannot give you specific ways to prepare for a job that has not yet been posted. Once you come into the BAU, there is a training process that includes classroom training and working with an experienced Agent-Profiler. This training period lasts for approximately 2 to 3 years. In other words, it takes a long time to become a fully functioning FBI Profiler. Keep in mind there is no one course of action to take in order to be promoted to the BAU. I can’t recommend whether it is better to have your advanced degree before you join the FBI, or to study for that degree once you get hired. That is a personal choice, with other important personal factors only you can consider including, finances, your personal situation, other career and family demands, etc. I would urge you to also contact your local FBI Office, the Applicant Coordinator’s Office, with your more specific questions about a possible career in the FBI and ultimately in the BAU. I hope this information is helpful to you. Good Luck in your career choices and successes. *Because of the number of inquires Dr. O’Toole receives from people who are considering a career in the FBI, she regrettably is not able to provide personalized advice for each inquiry. 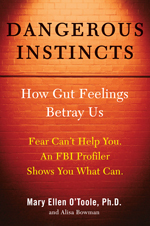 However, you can read about her cases in her new book Dangerous Instincts.